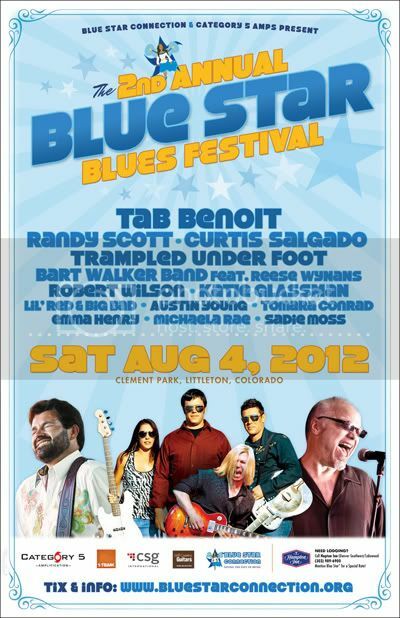 The 2nd Annual Blue Star Blues Festival (coming up on Aug 4th, 2012 at beautiful Clement Park in Littleton, Colorado) has been chosen as a filming location for a new fall series called Randy Scott: Chasing the Dream. MAV-TV will be on-location in Littleton, capturing Randy’s performance and some revelry surrounding the festival. Randy won the Guitar Center "King of the Blues" title in 2010. On December 8, 2011, Scott was signed by Steve Vai‘s label, Favored Nations. He is also been named "Best Upcoming Blues Artist 2012" on Ameriblues.com. Headliners for the festival include major award winners and some of the top draws on the blues circuit like multiple Blues Music Award-winning vocalist Curtis Salgado, one of the greatest living singers who also blows some ferocious blues harp. Guitar genius Tab Benoit, another multiple BMA winner, is also on the bill along with Trampled Under Foot, Bart Walker, Robert Wilson, Lil' Red & Big Bad, Katie Glassman, Emma Henry, Michaela Rae, Tomara Conrad, Austin Young, and young up-and-comer Sadie Moss. 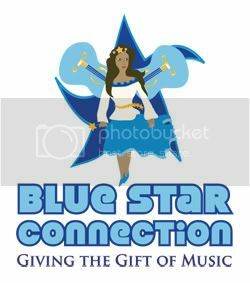 I don't know who gets credit for saying laughter is the best medicine and while I don't know if there are any studies on the matter, there has been a great deal of research about the healing power of music and that is the mission of Blue Star Connection. They give the gift of music to children and adults facing serious physical challenges, in part by partnering with hospitals nationwide. Tickets for the Blues Star Blues Festival are on sale now. General admission tickets bought in advance are $25, $30 on the day of the show. There is also a VIP package for $75 that includes exclusive seating for the day-long festival. Those unable to attend the August 4 show still have a great chance to experience the music when the episode of Randy Scott: Chasing the Dream airs later this fall. MavTV is available on services like DISH Network, Time Warner Cable, RCN, Cablevision, Verizon, Charter, among others. In the coming months they plan to expand onto additional networks including Comcast.